SPA capsule SUNHOPE SUN TREATMENT, buy for 2401 in Europe. Advanced technology in cosmetology allows you to receive the maximum benefit from modern methods of correction, destruction of body fat and combating cellulite. 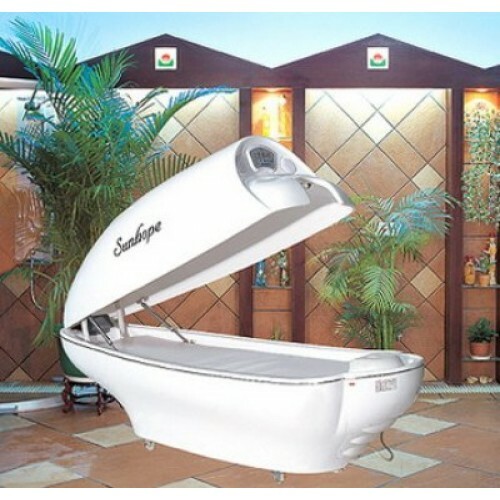 SPA capsule SUNHOPE SUN TREATMENT has all of these capabilities, for not only cosmetic procedures, but also for the hot vibration and spectral treatment. The ending result is enhanced using advanced scientific computer programs, which allow you to comprehensively resolve all cosmetic and even some medical problems of patients. This allows you to do a full range of cosmetic procedures: using infrared for a full warm by "dry steam" of the epidermis and muscle structure; vibratory massage with heating and the use of aromatherapy; light therapy spectral exposure using a color filter. Further, the air in the capsule is ozonated for complete cleaning and sterilizing it.